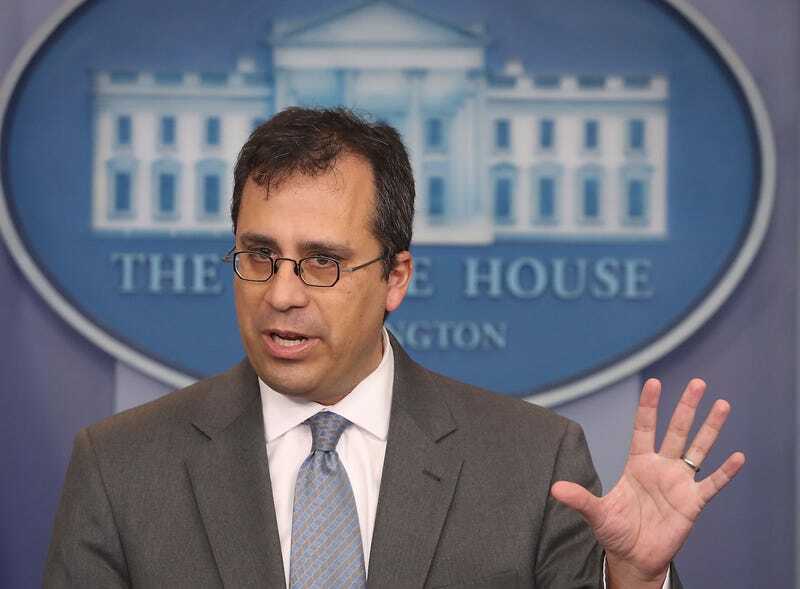 Director L. Francis Cissna of the US Citizenship and Immigration Services (USCIS), speaks during the daily press briefing at the White House on December 12, 2017, in Washington, D.C.
There’s government pork and then there’s just swine. Our posturing president, who is wasting colossal amounts of money to appeal to his rabidly anti-immigrant base, would be the latter. In June, the United States Citizenship and Immigration Services quietly announced a new task force that will investigate “bad” naturalization cases, wherein the agency will hire dozens of lawyers and immigration officers “to find U.S. citizens they say should not have been naturalized, to revoke their citizenship, and then eventually deport them,” according to The Takeaway, from WNYC and Public Radio International. CNN reports that that the new office in Southern California will review cases and then refer them to the Justice Department, which will then pursue denaturalization proceedings against U.S. citizens accused of fraud. In an interview with the Associated Press, USCIS Director L. Francis Cissna said the number of cases could reach into the thousands—this in a nation of about 325 million. Since the Obama administration, Immigration and Customs Enforcement has also been working to put more than 300,000 fingerprint records into a system that can be checked against citizenship applications. According to USCIS, the effort to followup on those records has resulted in 2,500 cases that have been flagged for in-depth review, and 95 of those have been referred to the Justice Department to date. A former chief counsel for USCIS, Ur Jaddou, now a director at the pro-immigration advocacy group America’s Voice, said it was “troubling” that the Trump administration was looking at what has been an ongoing issue. I think we all know—harassment, fear and playing to the piggiest of people.